For many people, the study of poetry is intimidating. Reading and writing poems reminds some of the onerous task they had to surmount in order to graduate from middle school. Thank goodness for clear-eyed writers who can actually create a book on how to compose poetry and how to really enjoy doing it, too. 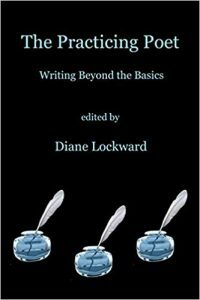 The title of Diane Lockward’s newest book The Practicing Poet: Writing Beyond the Basics may, to some, be slightly misleading suggesting that this book is more suited for seasoned language mavens. Rest assured, however, this indispensable book is filled with compelling tips that will entice poets at all levels of experience. The author of four full-length books of poetry, Lockward’s steady poetic sensibility allows her to simultaneously craft a delightful read alongside practical discourse. This book is sophisticated in that it shapes a dialogue that infuses the composition of poetry as both a deeply personal—and universal endeavor. Lockward expertly organizes knowledge, ideas, and experiences of 113 disparate poets, and tightly melds together their work and advice. Sharing is the key word here and the generosity of the contributing poets is nothing short of breathtaking. Indeed, magnanimity is the cornerstone of this book. Divided into ten chapters, the book features craft tips, sample poems, writing prompts, top tips, and bonus prompts. Beginning with technical, workshop-type concepts such as “Discovering New Material, Achieving Tone,” “Finding the Best Words,” and “Working with Sentences and Line Breaks,” Lockward guides the reader into the more refined and difficult business of poetry such as “Dealing with Feelings,” and “Transforming Your Poems.” Each chapter’s prompts spill over with tantalizing and provocative pathways to writing poetry. The final section, “Publishing Your Book,” offers ideas on how to organize a manuscript, section by section, how to promote your book, and how to coordinate a stellar public reading. The writing tips run the gamut from commanding poets who have oodles of time to write 10 pages every day (86) to the more measured assertion that 15 minutes up to an hour every day and keeping it “light and fast” is the better method for the time-pressed poet (243). The tips indeed epitomize the fact that everyone’s writing style is vastly different and utterly dependent upon what is going on in their lives. Lockward is inclusive of poets who dare to assert the notion that even a great poet can “accept a line as a productive day” (245). Featured poets not only give craft advice, they offer their own poems to be deconstructed and analyzed. The best parts of this book, in my humble opinion, are the unique prompts that highlight each chapter. These prompts are so lively and enjoyable, the reader will find herself stopping incessantly to work on them. The Practicing Poet imbues poetry with mysterious yet attainable virtues. The reader will want to carry around this book and reference it, often. The book’s format can be easily followed by the lone student of poetry as well as by a classroom full of burgeoning writers. While at times the breakout/prompt exercises in each section may tend to clutter the pages, and become slightly overwhelming, they nevertheless fit logically into the overall format. Ultimately, there is continuity to this book that, at best, can help open up our lives to the wondrous skill of poetry writing. Barbara Ellen Sorensen is a contributing writer to the Tribal College Journal and author of three books of poetry: Mary’s River (Kelsay Books, 2018), Compositions of the Dead Playing Flutes (Able Muse Press, 2013), and Songs from the Deep Middle Brain (Main Street Rag, 2010). Her first book received a 2011 Colorado Book Award finalist nomination, and her poems have been featured on the Poetry Foundation, American Life in Poetry, VerseDaily websites, and in various print journals.